Plant Sociology is an international journal edited by the Società Italiana di Scienza della Vegetazione (S.I.S.V.) (formerly Società Italiana di Fitosociologia). It publishes original research articles on all aspects of phytosociology, from community to landscape level. 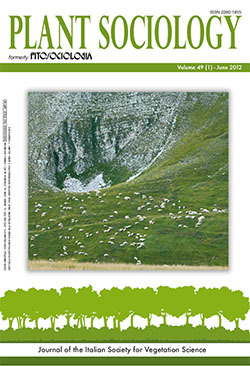 It will favour papers that point to the potential of plant sociology for ecological modelling and environmental quality assessment, developing models for vegetation interpretation and management based on rigorous and quantitative measures of physical and vegetation components as well as on proper statistical analyses. The journal is open to territorial studies that refer to wide biogeographical contexts and to contributions dealing with applied research, when they offer new methodological perspectives and a strict, updated vegetational analysis. Plant Sociology supports the Italian Vegetation Data Base VegItaly (member of the Global Index of Vegetation-Plot Databases - GIVD) and urges the contributing Authors to store their vegetation data in it. Plant Sociology succeeded Fitosociologia (1990-2011, ISSN 1125-9078) and Notiziario della Società Italiana di Fitosociologia (1964-1989, ISSN 1120-4605), the historical journals of the S.I.S.V. The name Plant Sociology is a tribute to the founder of Phytosociology, Josias Braun-Blanquet (1884-1980), who used it in the English translation of his major monographic work Pflanzensoziologie. Thematic issues focused on special events or topics may be published as supplementary volumes. Plant Sociology is indexed in TR Biosis Previews, TR Biological Abstracts, Elsevier’s A&I databases Scopus and Geobase. It is currently under evaluation process for other TR products.